The musician visited the West African nation as part of British charity Comic Relief's Red Nose Day appeal. 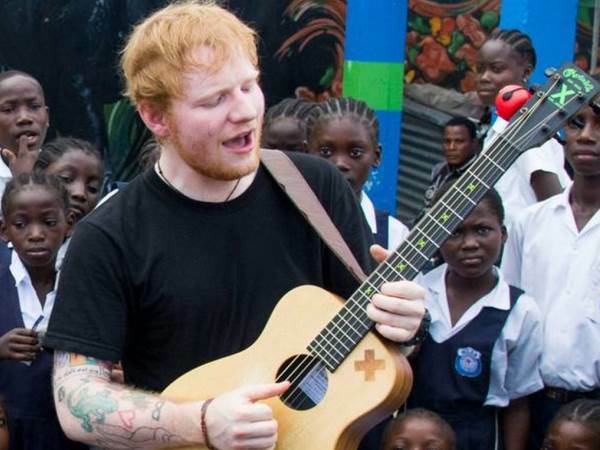 Ed Sheeran was left heartbroken after meeting a 12-year-old girl in Liberia whose father's death had halted her dreams of becoming a singer. The musician visited the West African nation, where almost 5,000 died in the 2014 Ebola virus outbreak, as part of British charity Comic Relief's Red Nose Day appeal. Ed has made a film for the charity event, but during a break from shooting a young girl came up to him to talk about her musical ambitions. "As we were taking a break from filming, a little girl came over to talk to me," he recalls in an article on the BBC website. "Her name was Peaches and unlike the other children I'd met, she wasn't in a uniform." The Shape of You singer, 26, was moved by the heartbreaking story of how she had been forced to leave school after her father died in the Ebola outbreak, so she could work to help support her family. He explains, "Peaches told me she wanted to be a musician when she grows up, and who knows, maybe she can make that happen, but for now, she has been forced to drop out of school and spends her days working in a filthy, dangerous slum, earning what she can to help feed her family." The British tunesmith agreed to play some songs with her and says he was struck by her musical talent but that she was distraught about the loss of her dad. "We had an impromptu jamming session and the girl could really sing. Peaches sang a song that reminded her of her father and as she did, tears started to roll down her face," Ed adds. "The enthusiasm that was initially shining out of her disappeared. It was at this point that the reality of Peaches' situation, and many, many kids just like her, hit me really hard." After hearing Peaches sing, Ed writes that given the opportunity, he has no doubt that she could be a star but that her and thousands of others like her need funding to return to education. Comic Relief's fundraising efforts culminate in the BBC's Red Nose Day telethon on Friday, where many of Britain's biggest stars will ask the public to help the world's unfortunate. Making his own plea on behalf of kids like Peaches, Ed adds, "I really hope the money we raise this Red Nose Day can help thousands of children, just like Peaches, to follow their dreams."